The H-2 horizontal takeoff / horizontal landing two-stage reusable space shuttle was proposed by Institute 601 of the Air Ministry in 1988. The first stage would used air breathing engines to accelerate the rocket-powered second stage to release velocity. This ambitious design would leapfrog China ahead of other spacefaring nations, but would be available no earlier than 2015. It was decided the concept was beyond Chinese technical capability, and it was not pursued further. Status: Design 1988. Payload: 6,000 kg (13,200 lb). Thrust: 2,400.00 kN (539,500 lbf). Gross mass: 330,000 kg (720,000 lb). Height: 85.00 m (278.00 ft). Diameter: 12.00 m (39.00 ft). Apogee: 500 km (310 mi). The H-2 shuttle concept was a two-stage system with horizontal takeoff and landing. The appearance and layout of the system was similar to the West German Saenger-II. Launch mass would be 330 metric tons. An aerospace plane with accommodation for two to three crew and a payload of 6 metric tons would be mounted atop the first stage. It was felt by the designers that the horizontal launch method would result in lower system weight and provide a more flexible system that could be operated from any airfield. The hypersonic lifting body first stage would be 85 m long and 12 m in diameter with a 36 m wingspan and three vertical stabilizers. The stage would have a launch mass of 198 metric tons and a landing mass of 79 metric tons. At launch the stage would be powered by six Lox/LH2/Methane engines with a thrust of 40 metric tons each and a specific impulse of 370 seconds. These would be supplemented by eight LH2-powered direct-flow ramjet engines with a specific impulse of 3500 seconds. The rocket engines alone would power the vehicle from the runway to a speed of Mach 0.8, at which point the ramjets would ignite. Up to an altitude of 9 km and a speed of Mach 1.8 to 2.0 the rocket and ramjet engines would operate in parallel to provide a constant acceleration, the rocket engines throttling back as the ramjets increased in thrust. 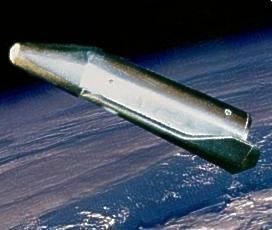 Thereafter the first stage would be powered by ramjet thrust alone until it released the orbiter at an unspecified hypersonic speed. It would then return to its launch base. With a high-aspect ratio version of the US space shuttle's double delta wing, the orbiter would have a length of 40 m, a wingspan of 12 m, and a fuselage 4 m in diameter. The orbiter would have a launch mass of 132 metric tons, a landing mass of 25.3 metric tons, and would be equipped with four Lox/LH2 engines with a specific impulse of 460 seconds and thrust of 21 metric tons each. These would take the stage to an elliptical orbit of 100 to 300 km altitude. Further engine maneuvers could take the spacecraft up to a 500 km altitude orbit. China began preliminary work on manned spaceflight again in July 1985. The decision came against a background of vigorous international space activity. The United States had its Strategic Defence Initiative and Space Station Freedom. The Soviet Union had its Buran shuttle system, Mir and Mir-2 space stations, and its own star wars program. Europe was developing the Hermes manned spaceplane, and Japan the Hope winged spacecraft. Even India and China were taking on ambitious space projects. It seemed China would have to take action to remain a world power. Ren Xin Min, the leading Chinese rocketry expert of the time, believed that China should make a space station its national goal. This would develop all aspects of space technology, including modern launch vehicle capabilities. In early spring 1986, members of a standing committee of the Chinese Academy of Sciences (Wang Da Hang, Wang Ganchang, Yang Jiachi, Chen Fangyun) proposed a family of seven Project 863 plans to accelerate Chinese technical development. These numbered plans covered biology, astronautics, information technology, military technology, automation, energy, and materials science. Astronautics plan 863-2 included section 863-204 space transportation system, which would service the 863-205 space station. It was estimated that two years would be needed for concept studies. H-2 horizontal takeoff/horizontal landing two-stage reusable space shuttle, proposed by Institute 601 of the Air Ministry. The first stage would used air breathing engines to accelerate the rocket-powered second stage to release velocity. This ambitious design would leapfrog China ahead of other spacefaring nations, but would be available no earlier than 2015. V-2 vertical takeoff/horizontal landing two-stage reusable space shuttle, proposed by Beijing Department 11 of the Air Ministry. The first stage would use liquid oxygen/kerosene engines, while the second would use liquid oxygen/hydrogen engines. Both stages would be winged, and first flight would be no earlier than 2015. Chang Cheng 1 (Great Wall 1) vertical takeoff/horizontal landing two-stage space shuttle, a compromise design created jointly by Shanghai Astronautics Bureau 805 (now the Shanghai Academy of Spaceflight Technology) and Institute 604 of the Air Ministry. An expendable booster, based on existing technology, would boost the winged second stage shuttle to a high altitude. The engines of the second stage would take it to orbit. This approach would allow a first flight to be made in 2008. Tian Jiao 1 (Pre-eminent in Space 1) vertical takeoff/horizontal landing spaceplane, proposed by the First Academy (now the China Academy of Launch Technology). It duplicated the aerodynamic shape of the American shuttle, but was a fraction of the size. Unlike the shuttle, the engines would not be recovered - the spaceplane would be launched by an existing expendable booster. Pursuing this as a more modest first objective would allow China to take an incremental approach to eventually achieving a reusable shuttle. Conceived as being able to fly in both unmanned and manned modes, Tian Jiao 1 could be available by 2003. Hermes spaceplane. Institute 611 of the Ministry of Air was involved in collaborative projects with France at the time. They judged the existing technical development of China and France to be roughly equivalent. This meant it would be possible for China to license-build the European Hermes manned spaceplane for its own use. This would be the quickest and most efficient way for China to obtain the latest manned spaceflight technology, with a first flight in the 1990's. Department 508 of the Fifth Academy (now the Chinese Academy of Space Technology) proposed a manned space capsule, recovered by parachute, similar to the Soviet Soyuz spacecraft. Department 508 argued that the Chinese industrial and technical base was not realistically up to developing winged reusable spacecraft, and that this would take a very long time and would not be flying until well into the 21st Century. A capsule should be developed in any case as a lifeboat for the space station, and would provide a Chinese manned space capability by the year 2000 - and until a winged spacecraft was available. Seventeen experts met in Harbin during 20-31 July, 1988, to make final assessments and recommend a course of action. It finally concluded that development of a winged reusable space shuttle system was acceptable as a national long-term goal to guide technology development But China did not have aerodynamic or rocket technology to develop a hypersonic aircraft with reusable rocket engines. The two designs that were considered technically achievable ranked very close in the expert's rating system - the Tian Jao 1 with a score of 83.69, and the Department 508 manned space capsule with a score of 84.00. The final 863-204 Expert Commission report in July 1989 advocated building the manned capsule, with a first flight date of 2000. This would satisfy the leadership's desire for an early Chinese manned space capability, and establish the essential earthly infrastructure and spacecraft subsystems technology for more advanced systems. However in parallel development of technology for a two-stage-two-orbit horizontal takeoff and landing reusable space shuttle would be pursued, with a first flight date of 2015. The report failed to impress the government. Chinese leader Deng Xiaoping rejected both plans, saying that neither could be flying in his lifetime. The Chinese space establishment went back to the drawing board. However within three years the plan for a manned capsule would be resurrected as Project 921, which would make its first manned flight in 2003 as the Shenzhou spacecraft. Some work continued on advanced manned spaceplanes. Some photographs have been released of a wind tunnel model. The narrow fuselage and wing tip vertical stabilizers were strongly reminiscent of the United States' X-20 Dynasoar spaceplane of the 1960's. Another picture shows computer simulations of airflow around a different double-delta winged spacecraft. This has an appearance very close to the US space shuttle, but without a tail. The first model of a planned manned shuttle was exhibited at Hannover Expo 2000. This showed a double-delta winged spaceplane with a single vertical stabilizer, equipped with three high-expansion engines. Based on the size of the presumed two crew side-by-side cockpit, dimensions could be very roughly estimated as a wingspan of 8 m and a length of 12 m, and a total mass of 12 metric tons. This seemed about half the size but the same configuration as the six-engined orbiter designed in the mid-1990's. Any Chinese shuttle project will probably be realized in a different form than that originally planned some time in the first half of the next century. 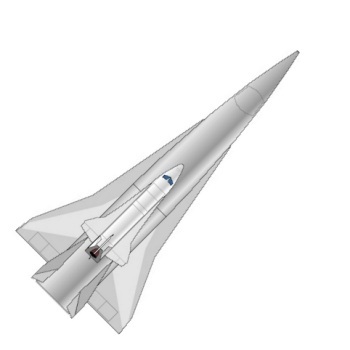 The Hannover model suggests that a modest spaceplane, launched by expendable boosters, would be flown before proceeding to any full-scale reusable winged launch vehicles. By 2002 Chinese space scientists were speaking of a two-stage to orbit, ballistic recoverable transport as the first recoverable Chinese space vehicle. The decisions by Russia and America in 2004 to abandon winged designs for the next generation of manned spacecraft and stick to manned capsules may mean that China will abandon any plans for a similar design. LEO Payload: 6,000 kg (13,200 lb) to a 500 km orbit at 52.00 degrees. Family: Chinese Manned Spacecraft, orbital launch vehicle, Spaceplane, Winged. Country: China. Agency: Beijing Department 11, Institute 601. Bibliography: 1791, 531. 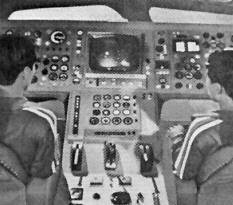 Photo published in 1980 of Chinese astronauts training in a shuttle-type cockpit. This wind tunnel model of a Dynasoar-like spaceplane may represent the orbiter stage of the 921-3 reusable spacecraft. This Chinese picture of computer simulated flow around a space shuttle-like shape might represent the booster stage of the 921-3 reusable spacecraft. Chinese spaceplane in re-entry attitude. 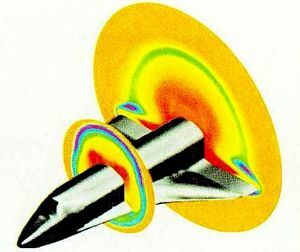 Dynasoar-like configuration based on published photo of wind-tunnel model.